My page devoted to vintage motorcycles. Motorcycles, history, events, the future of the motorcycle, examples and prices, original and restored. Circa 1985, here I am on my beloved 1984 Kawasaki GPZ 750 parked out front of my grandma's house. A day and a half earlier, I had embarked upon a solo cross-country ride on my bike; covering 1200 miles in about 30 hours. After a 4-day family reunion, I made my way back home. That's how I'd spend a week of summer vacation back then. Ahhh... The good old days. Welcome to my bike page entirely devoted to vintage motorcycles. Motorcycles are fast becoming the latest must-haves for long-time vehicle collectors and the new breed of vintage vehicle collectors. 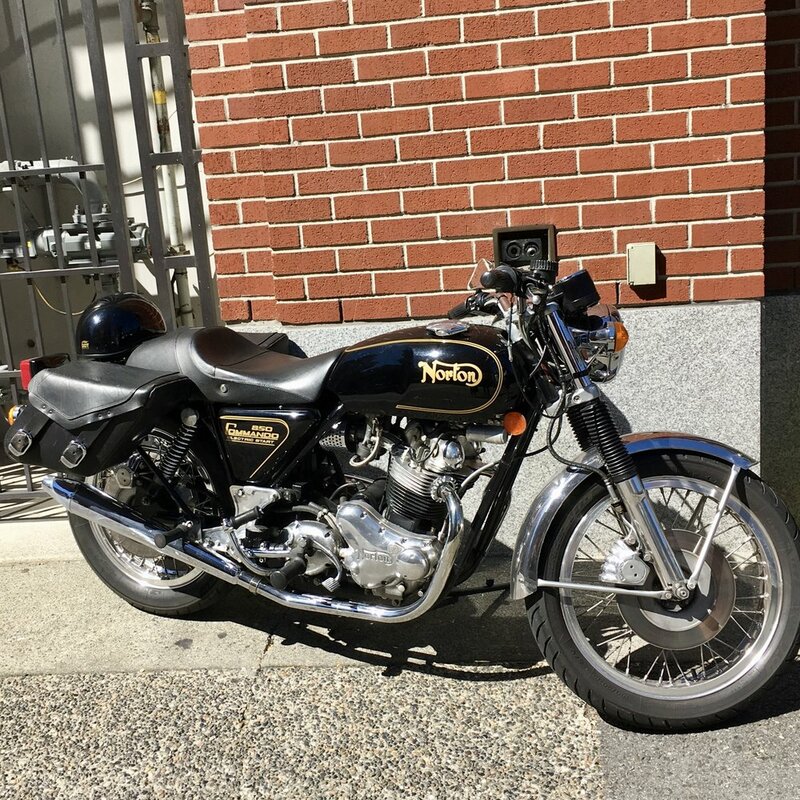 While British bikes like Nortons, BSAs, and Triumphs have been the mainstay for the past thirty or so years; Japanese, German, and Italian models are quickly catching up in popularity to become the bikes at the top of wish-lists of vintage bike riders and collectors alike. Then here a full three decades later, 2015 in Las Vegas on the floor of a 700-plus motorcycle Mecum Motorcycle Auction, standing next to a similar bike to mine. Apparel by See See Motorcycle. For awhile; I'd been searching around to replace my good, old Kawasaki. Finally, I found the one. She's a one-owner, original GPZ with only 10,000 miles on her. She spent the last decade neglected and collecting dust in someone's garage. All she needed was the right guy to come along to find her and to show her some TLC. It feels really great to have this old friend back in my life. Wish I still had that old sweater too! It's been a bit more than a year since I bought my second '83 Kawasaki GPZ 750 and I've had a blast putting 8,000+ trouble-free miles on it. Every free weekend was spent riding through Central and Eastern Oregon, as far east as Spokane and west out to the Coast. While the long rides were not the most comfortable; after a quick gas break, I was always ready to get back on and go again. Best of all, it has never broken down of left me stranded. This next year, I plan on checking out Southern Oregon and enjoying many more fun-filled miles. Shown in the above photo was my first real road bike. It was a 1978 Yamaha 850. What makes it rare was that it had a three-cylinder engine. Today it is quite collectible. Expect to pay $5,000 to $9,000 for a restored example. Pictured on the right is really what got me started. This was my first mini bike at aged ten. It made by the Sears Company in 1971. What started out as just a pile of parts, my dad put all together for me. I spent hours after school and all summer riding that thing around. 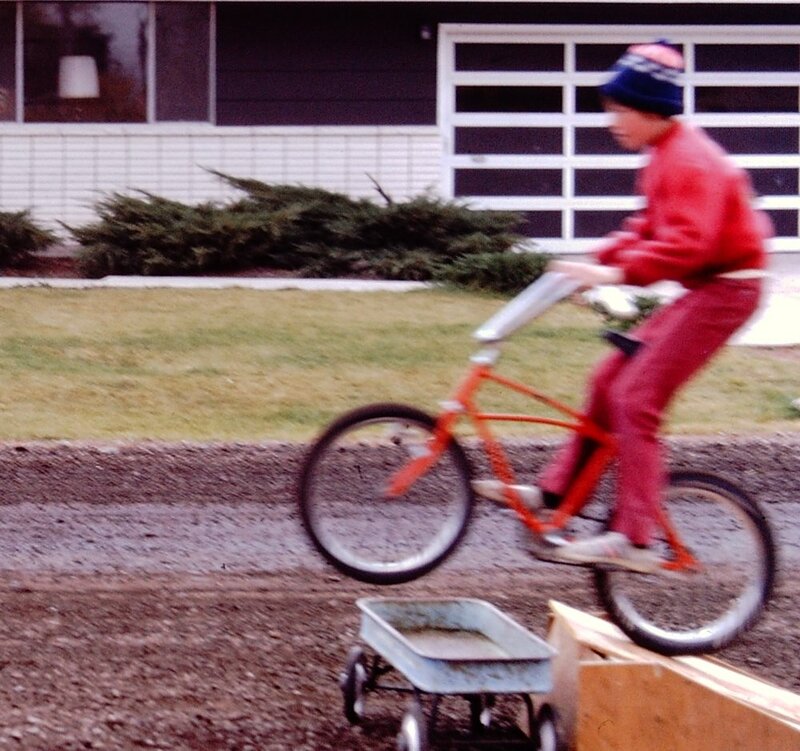 I was one of those lucky kids who grew up in the '70s who got to race go-karts for a decade into the early '80s. While the go-karts we raced from this time period were quite primative when compared with today's sophisticated models, they sure were a lot of fun to race. Because most karts were raced hard, wrecked, and repaired numerous times throughout their racing careers; when they were no longer useable or outdated, most were parted out. What little was left, went into the scrap heap. Move ahead now to 2015, those 40 to 50-year old karts are extremely difficult to find. Bare frames can be bought for just a few hundred dollars, while fully-restored examples can be priced over $10K. Nowadays, there is a strong market for vintage go-karts. There's even a racing series devoted to the maintaining and racing of these old machines. Check it out at Vintage Karting Association vkakarting.com. The Sang Froid Riding Club let a bunch of us 4-strokers join in on its most recent annual 2-stroke summer ride. My buddies and I met first at the Two Stroke Coffee Company in St. John for our morning javas, then we went on to the Lighthouse Inn at the official meeting place of the ride. We ended up at a member's Scappoose acreage where we all were invited to ride on his private dirt track. It was sure a lot of fun! I love Metalflake. Here is an entire wall of Metalflake helmets! Pictured below is an old school motorcycle fender that's never been mounted. I found and bought this at the See See Motor Coffee Company, where they have the occasional swap meet of bikes and parts. Pictured here are some of the unique things I found when I went to check out Progressive's International Motorcycle Show's PDX stop. They ran the gamut from helmet art to bike artists. Bike artists who worked with metal, Metalflake, as well as paint applied onto canvas with chopsticks. The ten-city tour started here in Portland, OR. Caught up with a couple of cool cucumbers on a high-pitched, Saturday morning with the Sang-Froid Riding Club Two-Stroke Street Ride. Sang-Froid comes from its Latin roots "Sanguis Frigidus" which translates into "cold blood" or "cool under pressure". This is the Portland-headquartered Sang-Froid Riding Club's motto. I thought I would share this picture with you. To some, it may look like a pile of junk ready for the scrapyard. In reality, there are actually several collectibles in this collection of old bikes. Early Hondas and vintage MX bikes are highly sought after in today's market. No one really thought that an old motorcycle would ever be worth saving; so many ended up in heaps like this. But in today's growing vintage motorcycle market, a single like-original part could be worth more than the entire bike itself was originally. Like a kid in a candy store with my bid card at the circuit's first auction of the year. Here I am in the audience at the Bonham's Classic Motorcycle Show in Vegas held during the first week of January. This 1978 Honda Elsinore was a favorite of mine at The One Motorcycle Show held here in Portland in February earlier this year. As I have mentioned in past, most MX bikes were not really considered worth saving. Though when restored, they can go for top dollar. This nicely restored example is valued at anywhere between $7,000 and $9,000. There have only been a handful of factory-produced turbo-charged motorcycles. Many of which have long been relegated to the scrap pile; either because they were wrecked or their engines blown. Because of the complex nature of their construction and engineering, sometimes they were left in corners of garages and soon-became long forgotten relics. Excessive turbo lag made riding any of these turbo-charged bikes extremely challenging. Most turbo-charged bikes were typically raced solely on drag strips where only then the full potential of the turbo could be realized. In the above picture is a Kawasaki Z 750 Turbo. Similar others produced in the late '70s and early '80s were the Kawasaki GPZ 750 Turbo, the Honda CX 500 and 650 Turbos, the Yamaha XJ 650 Turbo and Suzuki XN 85 Turbo. If you are looking to find a turbo bike for sale, make sure you have done your homework. Some of the best bikes I have seen have sold for more than $20K, but then I have also seen others on eBay going for less than $10K with no bids at all. How many of you have ever heard of the Rokon Motorcycle? Founded in Vermont in 1963, they were the first two-wheel drive motorcycle produced; using a combination of belt, chain, and shaft drives coupled with gear boxes to drive both front and rear wheels at the same time. While older models were powered by West Bend engines, newer versions have either a Honda or Kohler. Though not built for speed, it can climb any hill you put it up against. Interesting from an engineering standpoint a rare original Rokon in good condition can cost $2,500 to $5,000; while a fully-restored one close to $10,000. I finally dusted off my old CBX after it had been sitting for the past year. I don't get to ride it as much as I would like to. When I do though, it's always fun to see the reaction I get when people see a CBX for the first time. Most people hardly give it a second glance, but the bike guys know what it is. It is rare to see anyone else even riding one. That's too bad, because it really is a fun bike to ride; even with its oversized engine, weak brakes, heavy steering and skinny tires. It was built in an era when you wanted to go fast, you just put a bigger engine into the frame. But once you hear and feel the wonderful howl of the twin-cam, six-cylinder engine beneath you; you immediately know why the CBX will always make the short list amongst motorcycle collectors. Values are on the upswing for the Honda, too. You can still find beater bikes for under $3,000. Expect to pay $5,000+ for riders in good condition and anywhere from $12,000 to $20,000 for nearly original or fully-restored examples. Below are the accompanying photos of a Saturday ride out to St. Johns in North Portland from my Bikes and Lattes blog. Check it out for the video link from the same day! The Honda CT 70 was one of Honda's best selling motorcycles, nearly surpassing the CB 750 in overall sales in the 1970's. Ask any bike guy aged 45 to 65 what was the first bike he rode. Most will tell you it was the Honda CT 70. They were everywhere in the 1970s. Original MSRP was just $395. At that price, you could convince your dad to split the cost of it with your summer job earnings. They were virtually indestructible; so today there are still many left in varying conditions. They have also become quite collectible too. This 1970 model was bought at garage sale in non-running condition. It still has all of its original paint with a reproduction seat cover, but is missing the front fender. Should you buy one? I think so. Expect to pay anywhere from a few hundred dollars for just a pile of parts, to more than $3,000 for a fully-restored one. Apparel by Bikecurious. This 1965 Honda 305 Dream had been forgotten in storage for many years when I found it for sale on CraigsList. All it really needed was a super good detail, a new battery, and a rebuild of the carburetor. I paid $1,700 and paid it a couple hours of TLC, then sold it at auction for $3,100. If you are ever in Portland, Oregon make sure you take a trip down to Wilsonville to visit the World of Speed Museum. 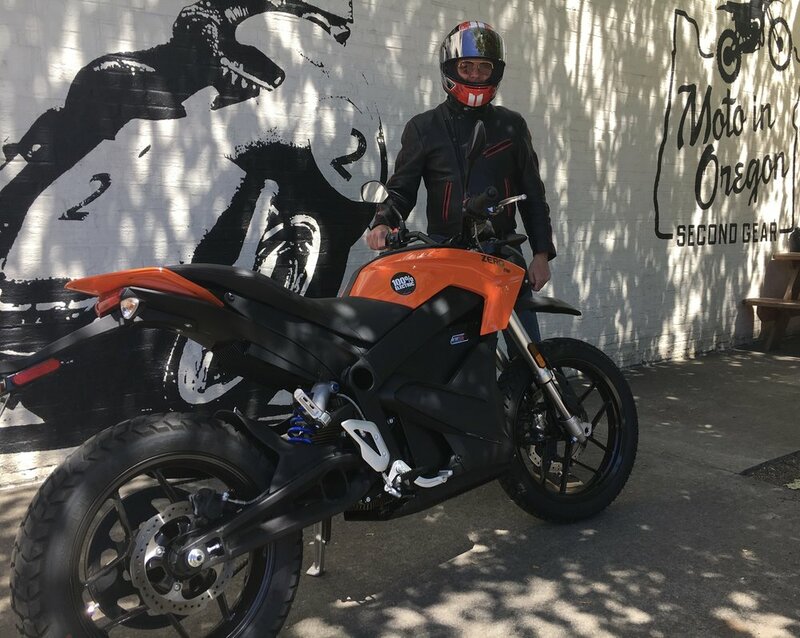 Here I'm standing next to some of the Pacific Northwest's history-making race bikes. The World of Speed all dressed up for a night of celebration and fundraising! You never know what you're going to find at your local swap meet. On a recent Saturday, I took a quick stroll through Cycle Heap's annual Moto Meet here in the Rose City. It looked like a tailgate party of motorcycle parts. I went because I'm looking at racing a vintage dirt bike next year. This rare Can Am caught my eye. Bob Lanphere Senior's collection of rare bikes is located in Tigard, Oregon. Not too far from Portland, I went over to check it out. Because he was a Honda guy, there are lots of them displayed at his car dealership. Here are a couple from the bunch. Some are displayed alongside black and white photos of Bob riding them back in the day. I walk past this beauty enroute to my caffeinated watering hole nearly every day. She's always sitting in the exact spot on the street in the rain. This day, it didn't happen to be raining; so we stopped to take a closer look and ended up snapping some pics. A Honda CB350 Four in great condition; this one in Candy Bacchus Olive must be a 1972 or 1973. In 1974, it was offered in only one color. All-told, this specific model was produced a few short years between 1972 and 1974. Not only are the bikes within the pages of the Bonhams catalogues works of art, but so are the font and photography of the publications themselves. These are this autumn's pair of beautifully designed Classic Motorcycle Mechanics Show catalogues. We've got another moto cafe in town. Sweet! Great vibe. Good coffee. An upstairs loft. A couple of cool vintage Yamaha bikes. Big screen playing back-to-back bike races. Yet family-friendly. It's on North Lombard Street, just on the other side of the St. John's Bridge, which happens to be one of our favorite bridges here in Portland. It's the Two Stroke Coffee Company. Open seven days a week, early till late. Take a peek! A bunch more vintage bikes that I came across at some shows this past summer: a Honda extravaganza in Jackson Hole, Wyoming; some mixed bikes at the Forest Grove Concours d'Elegance, a show of cars and motorcycles that takes place at the Pacific University here in Portland; and finally, a rare Vincent at the Antique Air Museum out in Hood River. Another year means another Bonhams bike auction. Yeah! My latest moto madness... Love having the old GPZ back in my life! To complete the entire package, I recently got a new Shoei helmet too. Fits like a glove! My favorite kind of mountain bike. Two of my favorite moto-friendly Oregon pitstops: Two Stroke Coffee Company in St. John, above; and below, Eastwind Drive-In on the main strip of Cascade Locks. The wide open spaces of Sherman County, Oregon. The Honda CBX engine always makes a statement. There was competitive bidding all the way to the end, as Steve McQueen’s Triumph sold for $175,000. I think this 1978 Kawasaki Z1R-TC made for just two years was a buy at $16,000. Off for my last ride of 2018. I like this old poster. My dad found this nice Honda ct 70 at a garage sale. He ran out of space in his shop so in he gave to me. It travel down to Portland in his camping trailer.